From the clouds above to the earth below, research by the former Fundamental Science Directorate has made important contributions to understanding our world and ourselves. Pacific Northwest National Laboratory scientists were part of the first major assessment of the energy, economic and land-use implications of stabilizing global change. In addition, PNNL is managing two field research sites being established by U.S. Department of Energy to investigate subsurface transport of uranium and other contaminants. Beyond our environment, PNNL researchers, through advanced three-dimensional mapping, have demonstrated a technological platform for spatial mapping of mouse brain proteins, which may accelerate the development of a cure for neurodegenerative disorders such as multiple sclerosis. To help protect our environment and provide clean energy sources, scientists at PNNL are examining catalysts, materials that increase the speed or efficiency of reactions. In a highlighted study, PNNL researchers and their collaborators discovered that a single hydrogen atom cannot keep still after it splits from a water molecule on the surface of a specific catalyst. The hydrogen atom hopscotches across the oxygen atoms that stud the catalyst's surface, while what remains of the water molecule stays fixed, suggesting that the electronic structure of this catalyst is not as it seems. 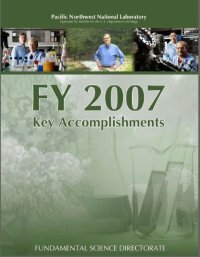 Copies of this full-color annual accomplishments report are available online.